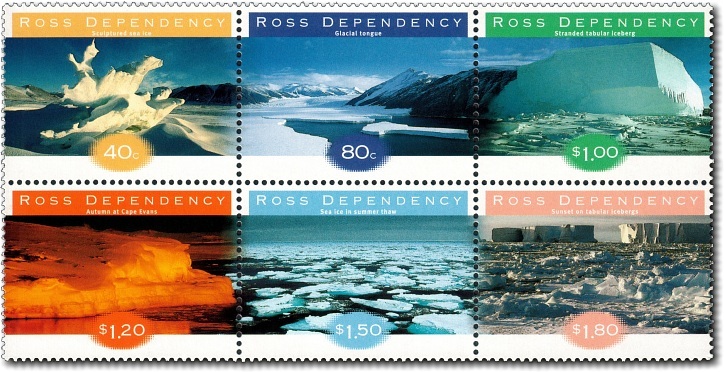 Antarctica is roughly twice the size of Australia – some 14 million square kilometres. 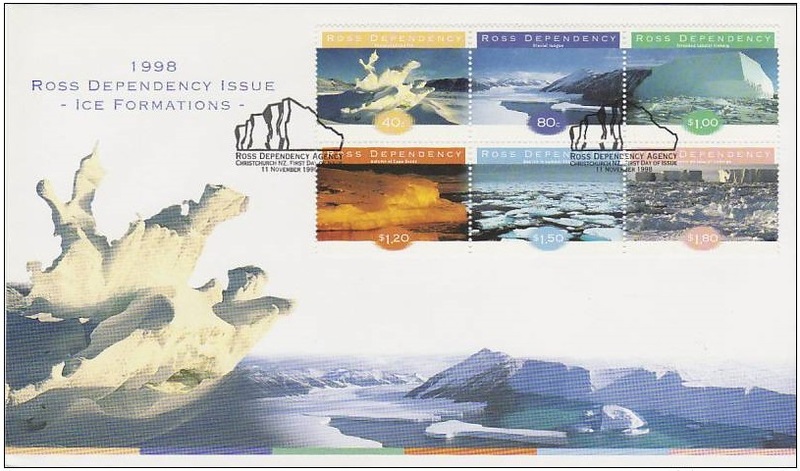 Massive glaciers flow down from the ice cap to merge into flat-topped ice shelves. 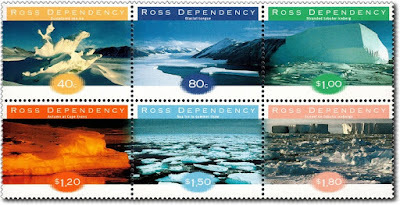 One of these is the Ross Ice Shelf on what is known as the Ross Sea. This shelf is moving, pressing forward all the time. The airfields on the ice have to be move regularly, keeping then from drifting way from the bases on land. Relentless activity takes place all year round on this huge shelf, as nature creates daunting shapes and fascinating colours. This issue features examples of some of the ice formations that have been captured on film. 40c - Sculptured Sea Ice. 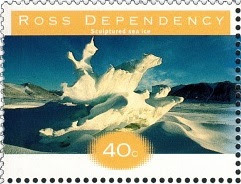 Sea ice formed during winter and early spring are eroded into works of art during the brief Antarctic summer. 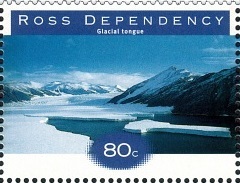 Glacial tongues, such as the one in Robertson Bay, North Victoria Land, float out into the water, sometimes for many kilometres. 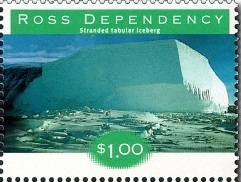 $1.00 - Stranded Tabular Iceberg. 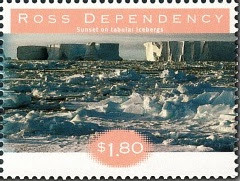 Flat-topped tabular icebergs, carved from huge ice shelves or glaciers, roam the Southern Ocean. $1.20 - Autumn at Cape Evans. 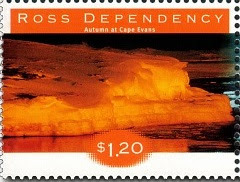 At Cape Evans, the site of Captain Scott’s base, the glow of the autumn sun lights up the edges of the ice flows. 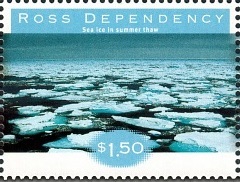 $1.50 - Sea Ice in Summer Thaw. The formation of sea ice around Antarctica during the depths of winter is one of nature’s most dramatic large-scale phenomena. The continent almost doubles in size. $1.80 - Sunset on Tabular Icebergs. Antarctica is famous for its gigantic tabular icebergs, some of which are up to 200 kilometres long. Antarctic Ice Formations - First Day Cover.